Random Thoughts. But things that are really not random at all. Yesterday I got a phone call from US Army medic/veteran Babe Gantz in Scranton, PA. He wanted to thank me for putting the National WWII Museum in touch with him. They came to his house and did an interview with him. His call came during a class with my 9th graders-they were good when I shushed them and pointed to the phone at my ear. (When an 89 year old calls you and wants to talk, you don’t tell him it’s a bad time. ) When I got off the phone I told them who he was, and how he spent six weeks’ time with the survivors after their liberation, and how much it traumatized him then, and what meeting some of them, 67 years later, has done for healing him now. Frank Towers wrote to invite me to Louisville for the next reunion of 30th Infantry Division soldiers of WW2. Frank is 95 and still researching the survivors from the train near Magdeburg, who he carried to Hilersleben in our US convoys after the stopping of the train by the tank commanders. He is working on his drafts and always updating our list, and we are up to over 230 survivors now. Carrol Walsh, the tank commander whose interview with me started this whole thing, is settled and doing nicely with his wife Dorothy down in Florida. 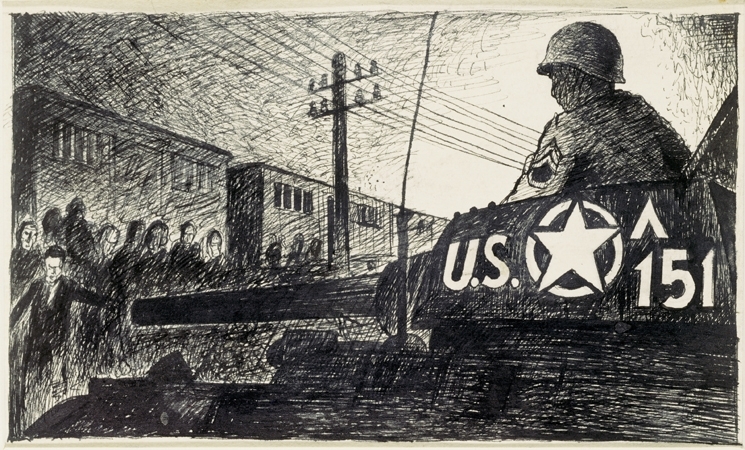 It could very well be Carrol in this drawing by survivor Ervin Abadi of the 1945 liberation day. He was a Hungarian artist who nearly died in Belsen. Of course he did not know who the American driving the tank was. None of the 2500 liberated did. They do now. Because of a teacher and his kids, who cared. In the middle of the journey of our life, I came to myself in a dark wood where the straight way was lost. The other day I received the Holocaust library of one of the survivors who really meant a lot to me, who passed away earlier in the year. His daughters wanted me to have them. I unpacked two big boxes of books and put them on my bookcase. The first title I picked “randomly” to open was In the Garden of Beasts by Erik Larson, about the unfolding Nazi horror through the eyes of our first diplomat to Hitler’s Germany in 1933. “In the middle of the journey of our life, I came to myself in a dark wood, where the straight way was lost.”– from Dante. The Divine Comedy. I read it, and re-read it. Over and over. It resonated with me as if my friend Steve was speaking to me from beyond. And I know he was. In the ABC News video, he explains how his life was profoundly altered, and it is a reminder to me that the choices that I have made as an educator are for the sake of humanity. The wood is dark. I can now see that the straight way may be lost, but I come to myself. The path is still there. Creating meaningful life learning experiences for our kids are what being a teacher is all about. Don’t all real teachers do this, for the sake of humanity? I’ve just put the finishing touches on student speeches for our National Honor Society induction. The 12th grade members have to deliver these to their younger peers who are now being inducted. We cultivate the ideals of character, leadership, scholarship, and service to others. The seniors speak of individuals in history who have gone through trials to triumph in the face of adversity. We have been practicing night after night for the big day tomorrow. They will make their parents and teachers very proud. Thank you for what your children are doing- for me. You are doing great work. I appreciate the difficulty you must be facing, but unfortunately this is the world now..sadly results is what a lot of folks want to see, they forget the results of teaching “thinking” and learning through thinking..
You also face an extremely ( at least some of them) dysfunctional youth, and parents..something you cannot be responsible for..but which you must deal with. Michael-“We Keep the Faith”-motto of the 743rd Tank Battalion of WWII (pictured above). Thanks for stopping by.